But wait for the excuses. There won’t be any excuses. Nobody on the side of the warmists will say anything about this at all, so nobody in the general public will find out about it. True, but just wait for the punch up on WUWT. The sad thing is it doesn’t matter how much the data goes against the predictions, even very reasonable people seem impervious to being swayed from their belief in climatism. Many people, particularly on the left in my experience, genuinely care about the environment but have got into a state where they think just because they care (and presumably skeptics don’t) any action is justified, despite the obvious direct costs, waste of resources, opportunity costs and many obvious practical downsides. I agree wolsten, we really do seem to be in some kind of ‘post truth’ dystopia. I’ve been re-reading a stack of 5-year old Science Fiction magazines, and I’m continually surprised that SF writers (who should be expected to look at the SCIENCE) were (and are still) taken in by the MSM’s CAGW yelling. To the extent that, in 2014, some were writing about the ‘heat death’ of the world! For me, all it took was Crighton’s “State of Fear”, plus following up his references, to become a skeptic! A very popular SF book right now is ‘Ready Player One’, I really like the book but features an armour plated bus – powered by solar panels. It would not have moved an inch hehe. I discovered State of Fear late on in my journey “into the light”. An excellent read which was surprisingly hard to get hold of. Isn’t interesting that it’s always LOCAL if you talk about temperatures where you are, so it’s not GLOBAL. Yet, a melty spot in Western Antarctica is GLOBAL and so is the lack of ice in the Arctic on the graph warmists shove in your face concerning ice volume, yet a ship stuck in ice where there should be none is LOCAL. I finally understand: LOCAL is when it harms the mantra, GLOBAL is when it helps. So it’s not really a geographic destination, but rather a way to identify right and wrong thinking patterns. Reality can be very inconvenient for some. Yes, it certainly can. But worry not, they’ll find a way to ignore it and go on about their fantasy beliefs. Have you seen the error-ridden article by Anne Casselman in The Walrus of July/August 2018? I have to give you credit that you can even read that horribly flawed publication. Suzuki has the usual disparing article. It’s just one big propaganda sheet. Are there any non-error-ridden articles? Wadhams never learns, but is a professor. How does that work? His ‘bosses’ don’t have the cojones to point out his multitude of failed predictions. Of sociology probably. 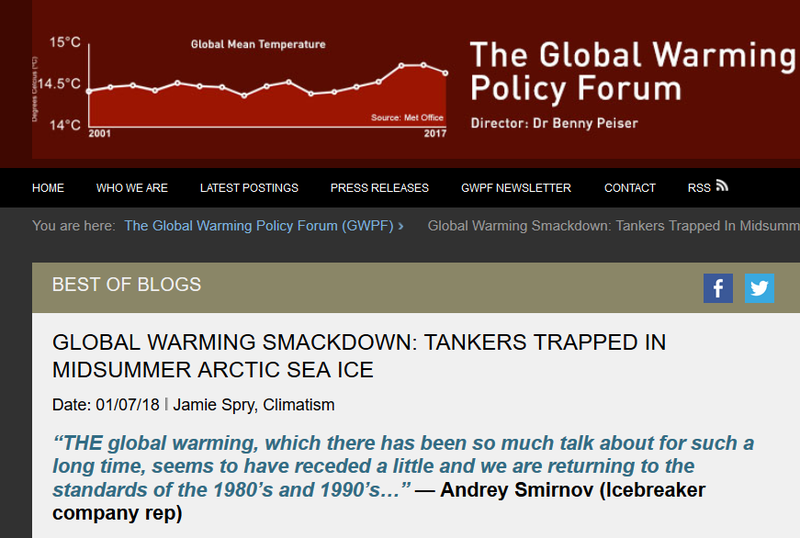 The Obama USA chief rep to the IPCC was a Dr. Turns out a Doctorate in public administration (and thats something they have horribly wrong as well). Those ice breaker tankers have managed to operate to European disports through the worst part of winter: the Christophe de Margerie’s maiden commercial voyage was to Grain just ahead of the New Year. N.B. these tankers are supposed to be able to cope with 2m of ice unaided. All that ‘trapped’ summer Arctic heat has obviously tracked south. Express warning for summer ‘2018’ – it’s gonna be the “hottest evah”! Cued in massive swelters of alarmunist hyperventilation.